Golden buttons is a low-growing member of the Sunflower Family. It is sometimes referred to using the common names fleabane or rayless daisy. It's fairly common throughout Death Valley at elevations above 4500 feet. It also blooms throughout the summer and so if you're visiting the higher parts of Death Valley this summer you're most likely going to see some golden buttons scattered around here and there. Despite the similarity between the common names, Death Valley Goldeneye (Bahiopsis reticulata) and Nevada Goldeneye (Heliomeris multiflora) belong to different genera as you can see from their scientific names. While both are members of the Sunflower Family (Asteraceae), they aren't as closely related as their common names suggest. Sure the flower heads look quite similar, but other than that the plants are quite different. For instance the leaves of Nevada Goldeneye are linear and relatively small, whereas the leaves of Death Valley Goldeneye are quite broad. Interestingly, the scientific name of Death Valley Goldeneye was recently changed. Formerly it was Viguiera reticulata. Two new cactuses were added to my online collection of plants this last week. One was the fishhook cactus and the other was the old man cactus. Both are interesting cacti, but while creating the information pages to go with these plants, I found out that the scientific name for old man cactus had been recently changed. Formerly known as Opuntia erinaceae ursina, old man cactus is now known as Opuntia polyacantha along with three other varieties of prickly pear cactus that had previously been regarded as separate. Further, it turns out that chollas are no longer included in the Opuntia genus and now are listed as Cylindropuntia. The hike for this week took me to Corridor Canyon and included the completion of a goal I've had for a couple years to locate and photograph a bear poppy plant. 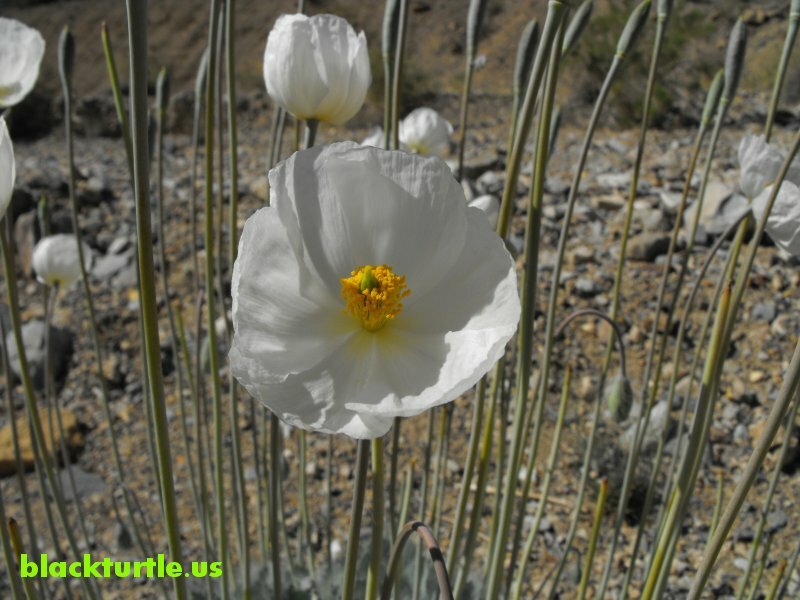 Needless to say, I was ecstatic when I first laid eyes on the first of five white bear poppy plants that I encountered on this hike. The plant is quite striking in appearance. The leaves, the flower pods, the seed pods, and the flowers are all distinctive and extraordinary in many ways.